At Whitestone Custom Homes in Virginia, we believe that meticulous supervision is the only manner in which to build a truly custom home. We believe so strongly in this that a “hands-on” approach for all projects has become our building philosophy. While many builders delegate critical work to design teams and foremen, at Whitestone, the owner is present at the home site daily in order to work with our tradesmen and ensure quality control. This superior level of attention is simply one advantage of building with Whitestone Custom Homes! Guiding homebuyers through a simple, step-by-step process, we enhance the building experience by providing practical advice, flexible accommodations, and educational insight. Whitestone Custom Homes believes in the power of communication and its ability to turn a laborious project into an enjoyable experience. Our step-by-step process was developed to help you stay involved in the creation of your home. Spend some time with our team and we think you will agree: with our passion and your dream, anything is possible. Being a local builder, they take pride in improving the neighborhoods. They were extremely easy to work with, and we couldn't be happier with the final product. My husband and I are thrilled! My husband and I are thrilled with the quality of work Whitestone Home Improvements puts into their homes. Their commitment to their clients during and after the purchase of our new home was absolutely fantastic. "The construction of our second home we have built with Whitestone was completed in Feb 2017. The building process was highly organized. The experience with Whitestone staff, the project manager, the architect, and sub-contractors was enjoyable and transparent. Whitestone takes personal responsibility for the quality of the results. Whitestone provided technical expertise and aesthetic sensibilities for all phases of the project resulting in complete satisfaction. Hundreds of decisions involved in the home building process requires the complete trust of your builder, and as evidence of our second build with Whitestone, they have earned it. We enthusiastically recommend Whitestone and would be pleased to respond to specific inquiries about our experience and our relationship with them." "In 2011 I met with Herb at WhiteStone to discuss plans we had for a tear down and construction of a new home in North Arlington. Herb listened to our needs and offered suggestions we might consider in the building process. From the design and configuration of the home, to details such as dormer windows, pocket doors, coffered ceilings, wide plank hickory floors, closet cabinets, in- lay custom cabinets, appliances, pho slate roof, fixtures and hundreds of other choices. Herb guided us every step, and provided the attention to detail that made us very comfortable. Everything was transparent and excellent communication existed through the entire process. Herb clearly communicated the timetable, milestones, and had everything completed on time. Several times during the process Herb suggested ideas to make spaces more enjoyable and the attention to detail is reflected as we enjoy the home today. Herb takes pride in his work and his homes are a reflection of his abilities as a builder. We found working with Herb a rewarding experience, we now have a beautiful, well-constructed home, and would work with Herb again. I am proud to have Herb show our home to potential customers and would offer this to anyone interested in going through this process with WhiteStone." "We feel so lucky to have found our Whitestone Home five years ago. 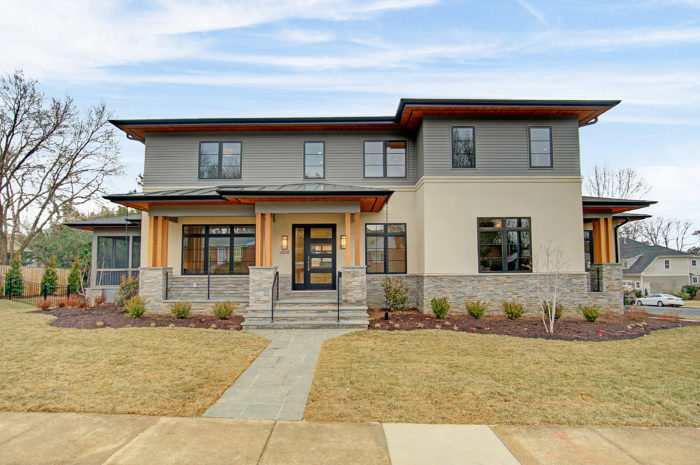 "We love our Craftsman style house. 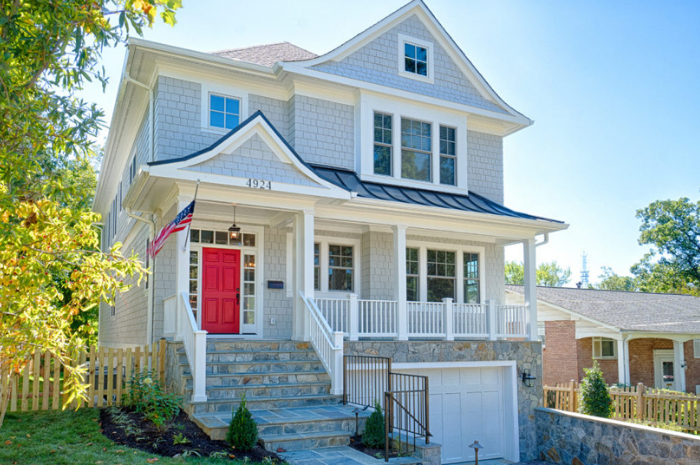 It is the most perfect house in Arlington, VA. I often think how lucky we are that Whitestone had such classy taste and designed a home that is roomy inside without looking ostentatious from the street. The house fits within the character of the neighborhood while harboring the modern amenities that we so appreciate. The kitchen is much larger than our shoe box that we navigated before. Fabulous cook top with 6 burners and a griddle and two ovens. The appliances are all top notch without being the most expensive available. The wainscoting and trim throughout the house is such a fine touch, even though dusting all of the ledges isn't fun. The tiles chosen for the master bath are wonderful. The subway tile throughout kitchen and bathrooms is timeless and shouldn't need to be updated in the future. Clean lines throughout the entire home with every space utilized--finished crawl spaces in the eaves are great for storage, finished attic made for a great teen bedroom. The master bedroom wall of windows makes it hard to leave the bedroom. It's such a pleasant and bright space. And the closets...after living in a 1930s Arlington home, I cherish the MBR closet. I never have to switch over from winter to summer clothes because everything fits and still room to buy more! All fixtures and hardware are great, but we did replace the kitchen faucet with a higher quality one. The house seems like it will age well without much maintenance or updating required. While a few things weren't perfect at move-in, Whitestone fixed everything on the punch list. The furnace coil needed a major repair early; however, the AC guy told us that they just don't make things well anymore, so fortunately it was under warranty. Lesson there: if you have Whitestone build you a house, buy higher quality major systems. Couldn't be happier with our home. Feel lucky to have found it and we never want to move. We LOVE our house." At Whitestone Custom Homes, we are passionate about making your home building dreams a reality. By honoring the personal vision of each customer while providing high-quality, complete construction services, we can transform your dreams into a beautiful, unique home.